Dubuque Street serves as Iowa City’s main entrance and key gateway into the community for residents and visitors. It parallels the Iowa River, and carries more than 25,000 vehicles a day between Interstate 80, the downtown business district and the University of Iowa campus. Park Road Bridge also serves as a critical transportation link for Iowa City. Together, these corridors provide vital connections for the community’s safety, commerce, neighborhoods and recreation. An aerial map of the Iowa City Gateway Project area. The Iowa City Gateway is located in northwest Iowa City. It includes Dubuque Street, Park Road and the Park Road crossing of the Iowa River. The Iowa City Gateway Project will raise Dubuque Street by 10 feet, or 1 foot above the 100-year flood level, while also replacing and elevating the Park Road Bridge to 1 foot above the 200-year flood level. Once completed, the risk of long-term closures of Dubuque Street due to flooding will be greatly reduced. Construction is expected to take 2.5 construction seasons and should be finished by August 2018. However, the City expects all lanes of Dubuque Street and the new Park Road Bridge to be open to traffic prior to August 2018. The City awarded the project to Peterson Construction, Inc. (PCI) for $40, 552,162.78, several million dollars below the engineer's original estimated cost of just under $52 million. Planning, design and construction of the project will be closely coordinated with University of Iowa work to Hancher Auditorium, the Mayflower Residence Hall Flood Mitigation project and with other Iowa City and Iowa DOT projects in the area. It’s also important to note that the corridor has many existing deficiencies unrelated to flooding that also will be addressed during reconstruction. Dubuque Street’s concrete pavement from Taft Speedway, south to Park Road is about 30 years old and requires replacement. Park Road Bridge was built in 1957 and currently is listed as functionally deficient with a full deck replacement needed and pedestrian access that is protected from vehicular traffic. Improvements to the Park Road/Dubuque Street intersection are needed to help reduce congestion. Pedestrian and bicycle safety concerns need to be addressed on the bridge, at intersections and at mid-block crossings. And a sanitary sewer trunk line upgrade along Dubuque Street needs to be accommodated. A look at a portion of the Gateway Project construction site. Click on the image to see our full construction photo album. Drivers should be aware that traffic is currently reduced to one lane in each direction between Foster Road and Ronalds Street and will remain that way through the duration of the project, which is expected to be complete in 2018. People can expect a 15- to 30-minute delay during the busy morning and afternoon commuting hours, but could experience longer delays during high traffic events like weekend festivals and Hawkeye sporting events. Drivers should be aware and plan their route in and out of Iowa City with construction in mind. Drivers who typically use Dubuque Street should consider using an alternative route. Park Road will also experience closures and lane changes throughout construction. 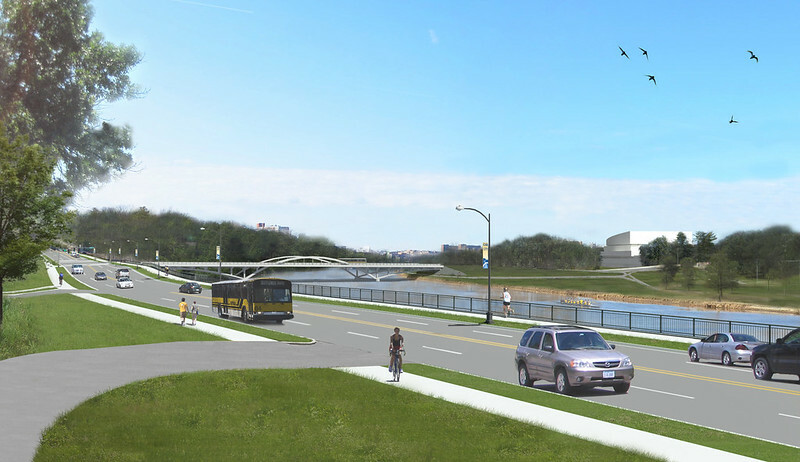 A rendering of the new Park Road Bridge as part of the Iowa City Gateway Project. Contact City of Iowa City Special Project Administrator Melissa Clow with questions or comments at melissa-clow@iowa-city.org or call 319-356-5140. Team members are available to speak to your group or organization about the project. The Iowa City Gateway Project is a partnership led by the City of Iowa City in cooperation with the Iowa Department of Transportation, the Federal Highway Administration and U.S. Economic Development Administration. Together, these agencies and the City’s engineering consultant form the study team that will be responsible for making the Iowa City Gateway Project a success.